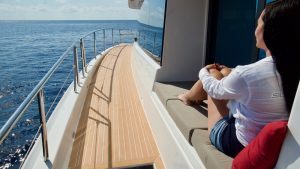 The S55 catamaran can accommodate up to six guests and three crew members, and is composed of three levels including a flybridge commanding 360-degree views, a 40m² air-conditioned salon, and four cabins – including one 7m-wide suite – each with queen-sized beds and private en-suite bathrooms. Built in 2018, this ultra-modern catamaran becomes the first 100% solar-run boat to sail in Asia, according to her designers, Silent-Yachts. The S55’s 30 mounted solar panels create 10kWp, which allows her to travel an unlimited distance on an average sunny day (though she also maintains a fuel-based back-up engine). 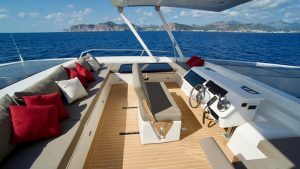 Two silent 30kW motors drive the S55 to a maximum speed of 12 knots. 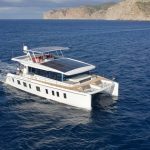 The solar catamaran will be skippered by Captain Ajun May from Germany, an experienced sailor in the archipelago, having previously piloted Burma Boating’s SY Y Not yacht. “Guests can look forward to wining and dining in comfort, in between diving, snorkeling and swimming among the 800 islands, coral reefs and atolls of one of the world’s last untouched paradises,” he said. Burma Boating caters to private tailor-made cruises on the S55 for up to six persons, starting at US$3,200 per day. It also offers a choice of 4-day or 6-day cabin charters leaving from the port of Kawthaung, southern Myanmar, each Saturday from November through to May. For bookings and enquiries, go to www.burmaboating.com or email info@burmaboating.com.